Skin issues like adult acne have increased 200 percent in the last 12 months forcing many women to take a closer look at the products they put on their face and body. 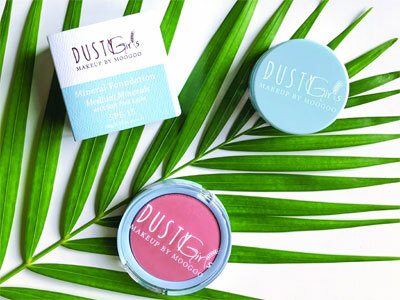 Dusty Girls Makeup brand manager Gabby Ruiz said the demand for mineral, and vegan, cosmetics has been driven by an increase in consumer knowledge and a shift towards natural products. "The average woman uses 12 personal care products containing 168 unique ingredients every day – for someone with sensitive skin that can make a big impact," said Ms Ruiz. "Many commercial makeup brands are made from ingredients such as talc, bismuth, parabens, UV filters and silicones which can irritate sensitive skin," she said. "These ingredients are commonly found in cosmetics as they are cost effective, however often they can trigger skin troubles." "Traditional mascara, for example, is made with pine tar. This is a common irritant, often causing itchy and watery eyes. Our mascara is made with Acacia Gum – which means people with sensitive eyes can use it." "Research suggest that mineral makeup is better for your skin, mainly because of the ingredients that are not used. There are plenty of alternative ingredients available, ones which won't cause your skin to flare up if you suffer acne or sensitive skin." Talc: Used in personal care products like eye shadows to absorb moisture and prevent caking. Some talc is also known to contain carcinogen asbestos, therefore is best avoided unless it's known to be asbestos-free. Bismouth: Naturally occurring very heavy element found in nickel, tin and silver and commonly found in many cosmetics – in particular foundations giving that 'glowy' finish. Parabens: These are a class of chemicals used to preserve makeup and curb bacterial growth. While it's certainly important to extend the shelf-life, and curb bacterial growth, a side-affect can be the disruptions of hormonal functions. UV filters: Studies have shown that several sunscreen chemicals indicate they mimic hormones and disrupt the hormone system. Silicones: Ensures makeup spreads better but it can accumulate on the skin and clog pores. Ms Ruiz said makeup doesn't necessary need artificial colour, oils, perfumes (number one cause of irritation or allergies) or preservatives, which clog pores and irritate the skin. "At Dusty Girls we use a combination of natural micas, zinc oxide, iron oxides and titanium dioxide, which has anti-inflammatory properties, making it perfect for those with problematic skin, or skin that is sensitive to sunlight following invasive procedures like chemical peels," she said. "This kind if makeup actually has a calming effect on the skin." "The main benefits of using mineral makeup is that it doesn't prolong, or worsen, irritations such as redness, dryness and blemishes by preventing the skin from breathing under the makeup." "It also doesn't encourage bacterial growth and it's non-comedongenic, meaning it won't clog your pores." "There is this misconnection that because is natural, it won't work as well as regular makeup. It actually gives great coverage and colour but at the same time is taking care of the skin health." According to the International Dermal Institute, chronic stress is a big factor in the rising number of people suffering adult acne. Earth Cream is a sheer to light coverage product, this is best applied with either fingers or flat foundation brush. When colour matching the Earth Cream, apply small streak along jaw line and down the neck. Make sure to blend it in using either brush or cotton tip. For extra hydration apply either the Skin Milk Udder Cream or Full Cream moisturiser as a primer. Suitable for combination to oily skin. Dry skin will need to moisturise. The Mineral Foundation Powder is a medium coverage, best applied with the Kabuki Brush. Same method as the earth cream for colour matching, apply colours along the jaw line and blend in with either Flat Foundation Brush or Kabuki Brush. This foundation works best when pressed into the skin, not swiped. Pour product into lid and swirl brush into product to ensure the kabuki brush is evenly coated. This product can be layered on top of the Earth Cream or worn by itself, depending on the customers desire. The more compact the brush is, the more product that will be applied to the skin, this bronzer is very pigmented, ensure you tap off the excess on the side of the packaging. The '3' application (as displayed in photo) is the best way to apply and contour the face. If used as an eyeshadow, use the small blending brush and sweep into crease, eyelid and lower lash line. We currently have two blushes in our Dusty Girl range – Pink Ladies (all skin tones) and Golden Delicious (medium – dark skin tones ideally) if a customer with fair – light skin prefers this colour, apply with a very light hand. After your customer has chosen her preferred colour, apply with the contour brush. Get your customer to smile and apply on the apples of cheek and blend back towards the ears. The highlighter is very versatile, you can apply it in a few different areas of the face. The colour is a light golden champagne, this will suit fair – medium skin tones. You can also use this as an eyeshadow, apply to eyelid, inner corner and brow bone. Can be used on the body. Apply to collarbone, top of the shoulders & down the front of your legs for extra glow. 3. Adds dimension to your face. Before applying your eyeshadow, apply a light layer of the mineral powder to ensure you have an even base, this will help eyeshadows blend easier and ensure they are as pigmented as possible. Always apply a moisturiser underneath the Earth Cream and Mineral Foundation, if you have a good base everything will blend and sit better on the skin! Colour matching the Earth Cream and Mineral Foundation, apply two – three colours along jaw line and neck and blend in a brush to see which colour suit their skin tone the best. Always apply the Mineral Foundation with the Kabuki Brush. Mix in any moisturiser with the Earth Cream to lighten it slightly is the colour is to dark. Use a shade lighter of Mineral Foundation underneath the eyes to use it as concealer. 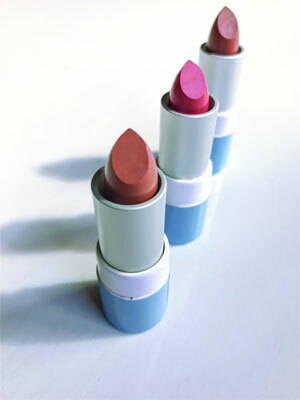 Use Chia Seeds Lipstick on cheeks as a cream blush (this will work for light to medium skin tones). Apply to back of hand first and use either fingertips or Flat Foundation Brush to apply. What's our number one beauty tip? Smile! Dusty Girls is created by Australian skin care range, MooGoo which has developed a cult-like following with one of its eczema creams snapped up every two minutes. Product include Mineral Foundation Powder, Earth Cream Tinted Moisturiser, Mineral Bronzer, Mineral Eye Shadows, Mineral Mascara, Vegan Lip Shine and more.